A market leader in the field, Essential Cuisine, wanted to create a more sophisticated (and better looking) tool for showing chefs just how much money they might save if they used their products. 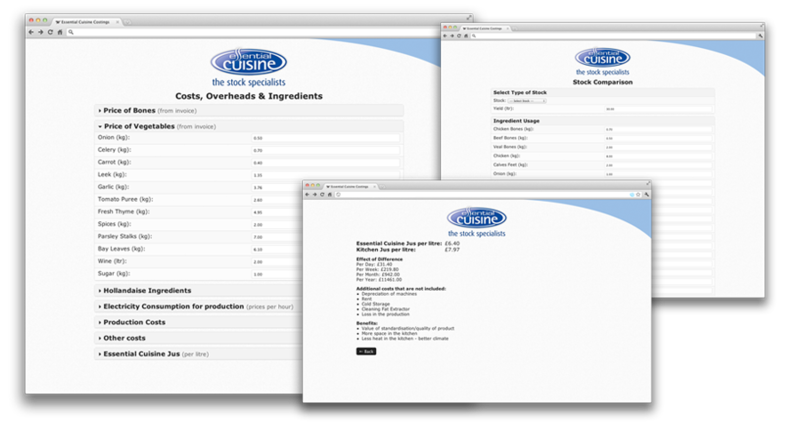 Previously the company had used a spreadsheet that took some getting used to to fully understand, but together we created a powerful calculation tool to allow chefs to input all their costs for making products such as chicken stock, along with overheads and other costs, and then compare their price per litre against that of Essential Cuisine’s products. The result was a simple interface with a powerful core, to be used by company reps help prospective clients just how much better off they would be if they purchased from the company. As the company couldn’t guarantee connectivity to the internet, the site had to work correctly offline, without relying on servers across the world, because of this there is no project link.